God bless you HGTV for bringing the amazingness that is Chip and Joanna Gaines to my living room each week. As someone who frequently feels like the opposite of creative - hey, whats the word for that? is there a word for that, or is no one who is creative enough to think of a word for that, that word - and so there is no word for "uncreative",that seems fitting. After reading "The Magnolia Story", I am inspired by not only the Gaines's creative passion but also their work ethic, faith, and their love for each and for their family... the list goes on. Really, I thought I loved these crazy kids, but after reading "The Magnolia Story" I'm head over heels. 1. "Fixer Upper" almost didn't happen - between Chip thinking that the show was a scam and their complete lack of charisma on camera, there almost wasn't a Fixer Upper. Crazy! I really enjoyed listening to how it all came together. After several failed days of filming, Chip bought Jo and the kids a house boat to live on- the camera got a glimpse at exasperated and level headed Jo and all in Chip- and the rest is history. 2. Chip lives his life as though everyday is Saturday- For many people Saturdays are a day to sleep in and relax, but to Chip, Saturdays are a day when the family gets together and puts in hard work relaxing together afterwards. It's easy to tell from watching Fixer Upper and reading this book that Chip embraces that hard work and then also equally enjoys the pay off at the end- finding time for both and they value they bring to each other. 3. Their financial road has been rocky - I was surprised to learn that much of the Gaines's business growth occurred during a recession. While Waco, Texas, weathered the recession far better than other areas of the country, it was still difficult make ends meet at times. One project in particular, a subdivision, went south when the bank pulled their funding due to a nationwide real estate crisis. 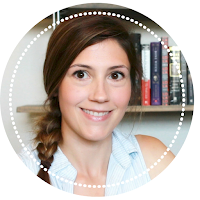 I was so impressed to read how instead of declaring bankruptcy, as most businesses might, leaving their contracts and washing their hands of the debt, Chip and Joanna made sure to pay back everyone they owed money. 4. Joanna's revelations about style and family - I loved listening to Jo talk about reconciling her ideas about style and her love of her family. One moment in particular struck me- Jo talking about seeing little black fingerprint marks on her white sofa slipcover. I have a one year old, and so while he can't do much damage yet- I know it's coming! It was so enlightening and encouraging to hear her speak about the importance of family over style and how the two can exist simultaneously. "Someday I might actually miss those little fingers prints.... I realized that my determination to make things perfect meant that I was chasing an empty obsession all day long." 5. Divine intervention is a common theme in their story - I was absolutely blown away by the number of times Chip and Joanna were "lucky". They both put everything on the line so many times, and each time they were rescued in one way or another when things got tough. Each time in their story that the odds seemed stacked against them, one person or another would come out and lend a hand. And of course, Chip and Jo had many stories about how they too had been gracious and helpful to others in their lives. Their story just really drove home to me the amazing way that helping someone can really impact a life! 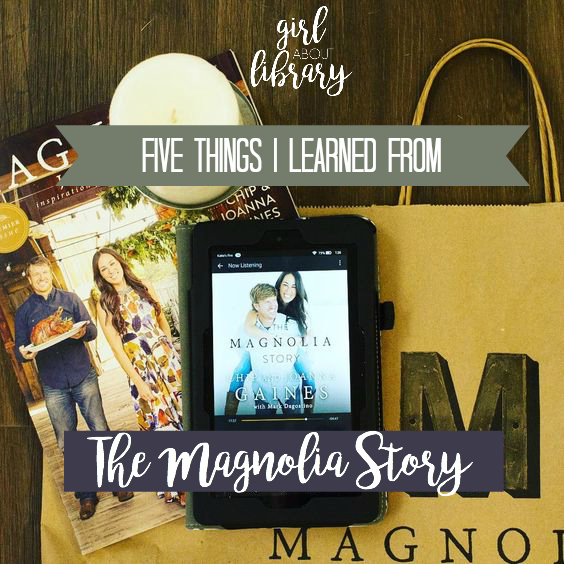 If you love Chip, Jo, and "Fixer Upper", you are absolutely going to love "The Magnolia Story"! 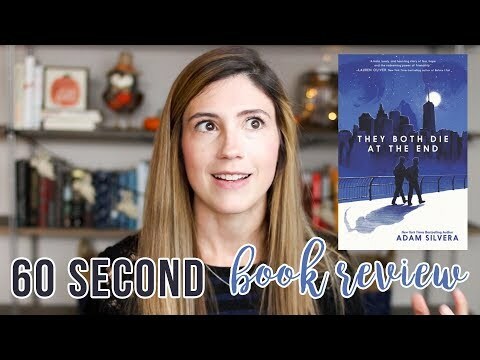 Instead of reading it, I listened to the audiobook and recommend that, too! It was so fun listening to the Gaines's play off each other, and it felt like they were in the room. Click here to find a copy of "The Magnolia Story" at your local library or click the image below to view the book on Amazon. I resisted Fixer-Upper so many times, but my husband loves it. Of course, I ended up watching it with him and falling in love with the Gaines as well. Chip never ceases to make me laugh. He is such a grown little boy, but his enthusiasm is so infectious. I will definitely have to consider reading or listening to this one.